THIS CONDITIONER IS FULL OF THE POWER OF ARGAN OIL AND YLANG YLANG, WHICH IS AN IDEAL BASE TO USE AS IT CONTAINS HIGH VITAMIN E AND FATTY ACID CONTENT BOOSTING THE MOISTURE OF THE HAIR AND WILL PROMOTE HAIR GROWTH. THIS CONDITIONER IS FORMULATED FOR ALL HAIR TYPES AND WILL ADD SHINE AND MOISTURE AS WELL AS DETANGLE AND NOURISH YOUR HAIR. 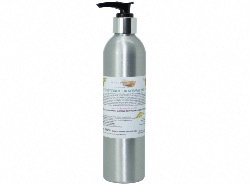 IT COMES IN A 300ML REFILLABLE ALUMINIUM BOTTLE THAT CAN BE RE-FILLED. RE-CYCLED OR RE-USED. THIS CONDITIONER IS FULL OF THE POWER OF ARGAN OIL AND YLANG YLANG, WHICH IS AN IDEAL BASE TO USE AS IT CONTAINS HIGH VITAMIN E AND FATTY ACID CONTENT BOOSTING THE MOISTURE OF THE HAIR AND WILL PROMOTE HAIR GROWTH. THIS CONDITIONER IS FORMULATED FOR ALL HAIR TYPES AND WILL ADD SHINE AND MOISTURE AS WELL AS DETANGLE AND NOURISH YOUR HAIR. THIS IS A WONDERFUL RINSE OUT CONDITIONER ESPECIALLY FORMULATED FOR BLACK AND DARK BROWN HAIR AND WILL ADD SHINE AND MOISTURE AS WELL AS DETANGLE AND NOURISH YOUR HAIR. WALNUTS HAVE LONG BEEN USED TO HELP STRENGTHEN BLACK AND BROWN HAIR AND ADD LUSTER AND SHINE WITH A TOUCH OF HIGHLIGHT COLOR. IT WILL NOT IN ANY WAY CHANGE THE COLOUR OF YOUR HAIR , BUT AFTER LONGER USE IT WILL JUST ENHANCE NATURAL DARK SHADES. THIS IS A WONDERFUL RINSE OUT CONDITIONER ESPECIALLY FORMULATED FOR BLACK AND DARK BROWN HAIR AND WILL ADD SHINE AND MOISTURE AS WELL AS DETANGLE AND NOURISH YOUR HAIR. WALNUTS HAVE LONG BEEN USED TO HELP STRENGTHEN BLACK AND BROWN HAIR AND ADD LUSTRE AND SHINE WITH A TOUCH OF HIGHLIGHT COLOR. IT WILL NOT IN ANY WAY CHANGE THE COLOUR OF YOUR HAIR , BUT AFTER LONGER USE IT WILL JUST ENHANCE NATURAL DARK SHADES. 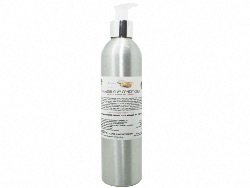 IT COMES IN A 300ML REFILLABLE ALUMINIUM BOTTLE THAT CAN BE RE-FILLED. RE-CYCLED OR RE-USED. THIS IS A WONDERFUL RINSE OUT CONDITIONER ESPECIALLY FORMULATED FOR DRY HAIR AND IRRITATED SCALP. IT CONTAINS INFUSIONS OF NETTLE, ROSEMARY, MARSHMALLOW ROOT AND HORSETAIL. IT ALSO CONTAINS VITAMIN E AND SOOTHING ESSENTIAL OILS, WHICH ARE KNOWN TO BE BENEFICIAL FOR THE HAIR AND SCALP DETANGLE AND NOURISH YOUR HAIR. IT COMES IN A 300ML REFILLABLE ALUMINIUM BOTTLE THAT CAN BE RE-FILLED. RE-CYCLED OR RE-USED. THIS IS A WONDERFUL CONDITIONER ESPECIALLY FORMULATED FOR DRY HAIR AND IRRITATED SCALP. IT CONTAINS INFUSIONS OF NETTLE, ROSEMARY, MARSHMALLOW ROOT AND HORSETAIL. IT ALSO CONTAINS VITAMIN E AND SOOTHING ESSENTIAL OILS, WHICH ARE KNOWN TO BE BENEFICIAL FOR THE HAIR AND SCALP. THIS CONDITIONER IS FULL OF THE POWER OF THE MORINGA TREE. THIS IS AN AMAZING TREE THAT CAN BE USED AS A VALUABLE SOURCE OF NUTRITION AS IT CONTAINS GREAT AMOUNTS OF VITAMINS, MINERALS AND PROTEINS. THIS CONDITIONER IS ESPECIALLY FORMULATED FOR NORMAL AND DRY HAIR AND WILL ADD SHINE AND MOISTURE AS WELL AS DETANGLE AND NOURISH YOUR HAIR. 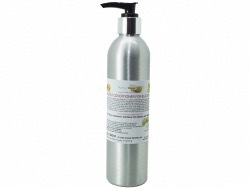 IT COMES IN A 300ML REFILLABLE ALUMINIUM BOTTLE THAT CAN BE RE-FILLED. RE-CYCLED OR RE-USED. THIS CONDITIONER IS FULL OF THE POWER OF THE MORINGA TREE. THIS IS AN AMAZING TREE THAT CAN BE USED AS A VALUABLE SOURCE OF NUTRITION AS IT CONTAINS GREAT AMOUNTS OF VITAMINS, MINERALS AND PROTEINS. THIS CONDITIONER IS ESPECIALLY FORMULATED FOR NORMAL AND DRY HAIR AND WILL ADD SHINE AND MOISTURE AS WELL AS DETANGLE AND NOURISH YOUR HAIR. THIS IS A WONDERFUL RINSE OUT CONDITIONER WITH RHASSOUL CLAY, BENTONITE CLAY AND ESSENTIAL OILS. THE CLAYS HELP DRAW OUT IMPURITIES AND TOXINS FROM PRODUCT BUILDUP ON THE HAIR AND SCALP WHILE RESTORING YOUR HAIRS NATURAL PH BALANCE AND HELPS ELIMINATE SCALP CONDITIONS LIKE DANDRUFF. THIS CONDITIONER IS ESPECIALLY FORMULATED FOR OILY SCALP AND DRY ENDS AND WILL ADD SHINE AND MOISTURE AS WELL AS DETANGLE AND NOURISH YOUR HAIR. IT COMES IN A 300ML REFILLABLE ALUMINIUM BOTTLE THAT CAN BE RE-FILLED. RE-CYCLED OR RE-USED.